Heavy fighting has broken out again in Juba, the capital of South Sudan, according to the United Nations mission to the country. The death toll has risen to 272 people, while gunfire has been reported near the UN’s compound in the city. Some of the most recent outbreaks of violence saw a UN building attacked, and a Chinese peacekeeper killed. Two other peacekeepers are said to be in a critical condition. The renewed fighting has been condemned by the UN, which is demanding the warring sides cease hostilities. The organization says it is shocked their facilities came under fire, when troops loyal to President Kiir clashed with opposition forces. 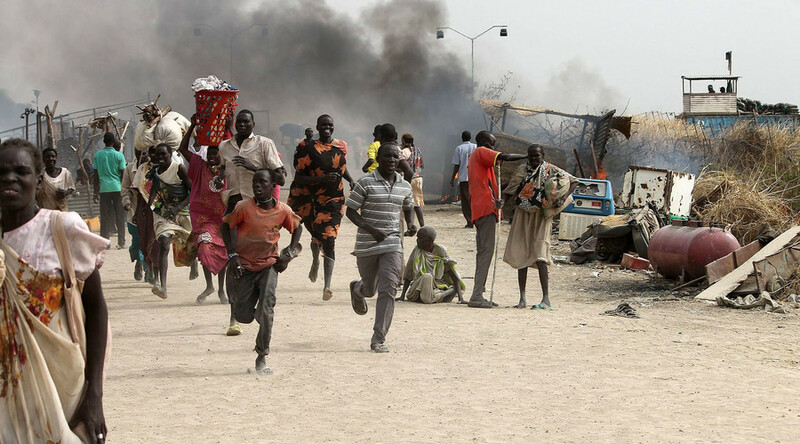 Yet a day after the UN Security Council called on the rivals, President Salva Kiir and Vice-President Riek Machar, to end the violence, fighting in South Sudan's capital continued, reports Reuters. The gunfire that ensued on Monday has raised fears of a return to a full-blown conflict. On Sunday representatives from the UN saidresidents in Juba fled after “heavy ground assault weaponry” was fired. A Hind Mi24 helicopter gunship has also been spotted flying over the capital. It is reportedly being used by President Salva Kiir’s troops to attack forces loyal to the country's Vice President Riek Machar. Machar’s residence was also attacked on Sunday by forces supporting President Kiir, however, his spokesman told Reuters that the situation is now quiet. "Dr Machar's residence was attacked twice today including using tanks and helicopter gunships. Helicopters from Kiir's side attacked the residence twice," the spokesman said. A government source told Reuters that fighting between rival factions in the country has killed at least 272, including 33 civilians. World's youngest nation celebrated its fifth anniversary since gaining independence from Sudan and there was relative calm on Saturday. However, on Sunday, gunfire was heard in the suburbs of Juba. "For about 30 to 40 minutes we heard sounds of heavy artillery in the direction of Jebel area," an aid worker based in Juba, who did not want to be named, told Reuters. Meanwhile Kenya Airways says it has suspended flights to the airport in Juba during to the security situation in the capital. We wish to advise our guests that we have suspended flights to Juba, South Sudan due to uncertain security situation. The violence in South Sudan comes just months after President Kiir, an ethnic Dinka, and rebel leader Machar, a Nuer, formed a new power-sharing transitional government, under a deal to end two years of civil war . South Sudan spiraled into civil war at the end of 2013 after President Salva Kiir sacked his deputy Riek Machar. Estimated 50,000 people have been killed and about 2.2 million driven from their homes during the conflict that began barely two years after the oil-rich state’s independence from neighboring Sudan in 2011. On Saturday, the UN Security Council “voiced concern” over the recent clashes, stating that the warring parties are not “being serious” about observing the implemented truce. The UNSC urged the parties "to resolve differences in a spirit of cooperation" to avoid further bloodshed. The UN Children's Fund (UNICEF) said in a statement that it was "deeply alarmed” by the violence. "Children and their families in South Sudan have suffered enough from violence, displacement and killings in this brutal conflict. It is time that peace becomes more than agreements on paper, but a reality for those who are most vulnerable," said the UNICEF regional director for eastern and southern Africa, Leila Pakkala.